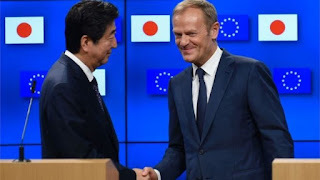 The outline plan was signed in Brussels after a meeting between the Japanese Prime Minister, Shinzo Abe, and the European Commission president, Jean-Claude Juncker, on the eve of a meeting of the G20 group of leading economies in Hamburg. It comes hard on the heels of the collapse of a long-awaited trade agreement between Japan, the US and other Pacific ring countries, the Trans-Pacific Partnership (TPP), which was scrapped in January by US President Donald Trump. The president of the European Council, Donald Tusk, said the agreement showed the EU's commitment to world trade: "We did it. We concluded EU-Japan political and trade talks. EU is more and more engaged globally." Mr Tusk also said the deal countered the argument put forward by some of those in favour of Brexit that the EU was unable to promote free trade: "Although some are saying that the time of isolationism and disintegration is coming again, we are demonstrating that this is not the case." He added that the deal was not just about common trade interests, but reflected "the shared values that underpin our societies, by which I mean liberal democracy, human rights and the rule of law".